Before diving in, if your movie files are named Some.Movie.aXXo.Xvid.BadTV.LoL.Crazy.2009.mpg or similar, you might consider changing the names to something more parsable, i.e. Some Movie.mpg. So do some spring cleaning of your video files first. Moreover, I ended up splitting my TV series and movies into separate directories. Why? Because imdb-thumbnailer seemed to not work so well on TV series. 2. Next you need to tell imdb-thumbnailer which folders it should be used on. The config file for this resides at /home/$user/.imdb-thumbnailer/config. 2.1. Open the config file using something like gedit /home/$user/.imdb-thumbnailer/config. It's important to note that you should increment the number within the square brackets for each successive path in the list. Also, imdb-thumbnailer behaves recursively. So, for whichever path you specify, it will thumbnail for any of the specified paths sub-directories. 2.3. Save the config file and exit. 3. Delete /home/$user/.thumbnails, i.e rm -R /home/$user/.thumbnails. 4. Browse your movie/film/video folder and watch imdb-thumbnailer do its magic. One issue I have noticed is that in some situations imdb-thumbnailer consumes mega amounts of memory. I have 2 gigs of RAM and at times I witnessed memory usage go from ~50% to ~80% all of which I could reasonably attribute to imdb-thumbnailer. The memory does get released pretty quickly, though. 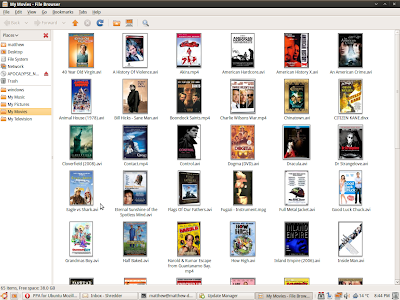 Tried and proven functional on Ubuntu 9.10 as of August 26, 2009. YMMV. I tried the above with both .avi and .mpg video files and it seemed to work without a hitch. The dialogue and the performances are often comical yet engrossing. The story, while linear, sprawls in terms of the narrative threads. There are only a couple of shocking scenes which are on the level of the ear scene in Reservoir Dogs. On the whole i didn't find it a graphic or gross movie. All of the characters are disposable soldiers (be they enlisted or not) for which I didn't feel any real sympathies or repulsions. For me the standout performance was that of Christoph Waltz, the Jew Hunter. But all of the actors are great with Kruger and Laurent offering more subtle and serious performances. There were only two or three moments where the lengthy scenes seem to fall flat and let the movie down, and I sorta missed the Americana-charm of Pulp Fiction or Death Proof. I can see why some will hate it -- or perhaps just be confused. But for those who enjoy the Tarantino style, they will be more than satisfied at what is by-in-large a dark comedy. Plus it has a few voice-over cameo's which are cool. Sharing folders on NTFS filesystems has always been a bit of a struggle in Ubuntu. It seems that as of Ubuntu 9.10 if you take the 'Sharing Options' route, you are now informed to add usershare owner only = false to the [global] section of /etc/samba/smb.conf. Believe it or not this is an improvement on past Gnome/Ubuntu releases. Nevertheless, a block of jargon filled text asking a user to edit their smb.conf is a cumbersome, error prone and off-putting approach to take for a modern desktop environment. In such a situation, surely there could be a simpler approach? When sharing a folder on an NTFS filesystem, a simple GUI could warn of any security risks, ask for an administrator password and then make the necessary changes. I have discovered ntfs-config. Its a nice little tool that takes the guesswork out of getting my NTFS drives setup the way I want. To use it, first remove any prior attempts at setting up an NTFS drive in your fstab. Its probably worth a log-out and log-back-in as well. You will be presented with a minimal GUI from which you can select which NTFS drives you would like to add to your fstab. You are also required to name the mount point... so in my case I went with 'windows' and 'storage'. These are then prefixed with /media/, thus the mount points become /media/windows & /media/storage. Confirm and permit write support and your done! Easy. Though it begs the question: why Gnome doesn't develop an integrated way of doing the above, perhaps in one of the drive Properties tabs?